I just received "Misty Melody" and was blown away. It is gorgeous! There is an enchanting quality, depth and mystery. The colors are amazing. Every time I look at it, I notice more beauty and detail. I was also delighted with the second painting - a wonderful surprise! This was my first purchase - but not my last. Many thanks! I ordered "Love by the Lake" and received the painting today. It is such a beautiful, colorful and stunning art work, created by a truly talented and insightful artist. I adore Leonid Afremov's work and I have already chosen two more paintings to order. I am so happy to support such amazing creative art! I've been struggling to find a piece of art I love for my living room wall for 1.5 years. 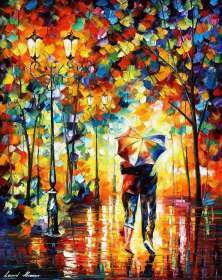 I stumbled upon Mr Afremov's work by happenstance and fell in love. It is often difficult for artists to have a painting filled with color that is not overbearing with those bursts of vibrance. 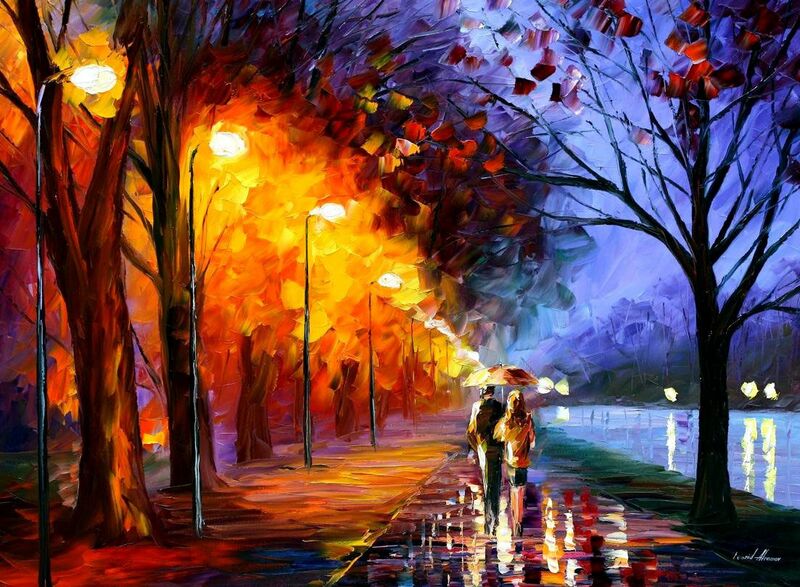 Mr. Afremov walks that line expertly; he perfectly balances color and meaning. The paintings arrived today and they are nothing short of stunning! Will be recommending to everyone I meet!